Ras Mohammad Reserve, Egypt, originally uploaded by Craig Grobler. Ras Mohammad (Arabic: رأس محمد‎) is a national park located in Egypt at the southern extreme of the Sinai Peninsula, overlooking the Gulf of Suez on the west and the Gulf of Aqaba to the east. After the Six-Day War, in which Israel gained control of the Sinai Peninsula, Israel established the Ras Mohammad area as a protected area. 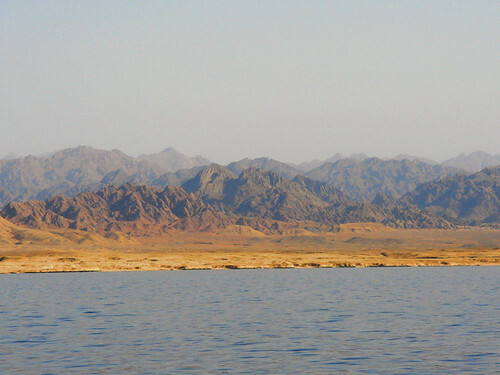 When the Sinai Peninsula was returned to Egypt, Ras Mohammad lost protection from fishing and other human activities. Some of the fishing methods, such as use of dynamite, also were impacting the coral reef in addition to the fish populations. In the late 1970s, pressure mounted on Egyptian authorities to place Ras Mohammad under protection. In 1983, the Egyptian Environmental Affairs Agency (EEAA) established the area as a marine reserve for the protection of marine and terrestrial wildlife. The park was also established to protect against sprawl from Sharm el-Sheikh and other coastal development.The name literally means "Muhammad's Head", where "head" in this instance means "headland". There is a saying in the area that the name arose because in side view the contour of the cliff looks like the profile of a bearded man's face, with horizontal hard strata providing the nose and bearded chin.